Barry Boyd has been a regular customer at the Chinese restaurant I’ve worked at for the last six years. He’s almost the only reason I’ve kept the job for this long. He sticks out as my favourite customer because he is genuinely interested in the little things I’ve been up to during the week, and isn’t shy of a bit of banter. I love hearing about the odd jobs he’s been working on, how his lawn mower is performing, and his vast collection of exotic birds. Over the years the little snippets of conversation we’ve shared while he waited for his Mongolian lamb have painted an interesting, although incomplete, picture of a man who has lived a very full life here in the Tweed Valley. I know it has been a tumultuous few years for Barry having lost his beloved wife who suffered from dementia. In the brief window I see into his life every Sunday evening, I see an interesting man who has overcome great loss with a strength testament to his character. 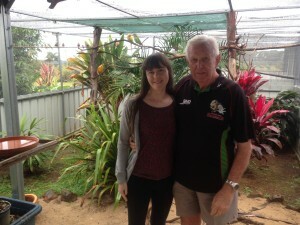 I went to visit Barry at his home in Duranbah just up the road from Tropical Fruit world in the Tweed Valley. He lives in his own comfortable quarters in a house shared with his son and his family. Barry has lived in this region all his life he tells me, “I was born and bred here. Born amongst all the lucky threes. I was born 31st of the 3rd, ’33. That makes me 83. So I consider myself lucky; number three is lucky for me.” I wouldn’t hesitate to agree with him, but I must clarify that I believe Barry has made his own luck. Growing up on a dairy farm in Condong, Barry was the fourteenth child out of his sixteen brothers and sisters. Being raised on a big self-supporting farm meant he learnt the value of hard work from a very young age. Every morning at daylight he would get up with his brothers and sisters to milk 150 cows by hand before school. Sounds like a lot of hard work to me but Barry assures me, “Kids today wouldn’t really know, wouldn’t have a clue of the good times I had on that farm.” He’s right, I don’t know and something in me is envious of his humble upbringing because it has certainly awarded him a strong work ethic. When I asked what kind of advice he would give to the younger generation, Barry stressed the importance of being careful with your money. Barry met his wife when he was twenty two at a dance in Parramatta. In their fifty seven and a half years together they worked hard for the things they wanted in life and made do with what they had. Barry shows me a picture of his late wife which he keeps on the wall in his living room. From the way he speaks of her I can tell the gravity of love and respect he still holds for her. Barry nursed his wife for nine years as her dementia progressed. In this time I can remember Barry coming into the restaurant giving me updates on her health and how he was coping. I could tell it was wearing on him strongly but he refused to put her into an aged care home despite himself being hospitalised three times as a result of the stress. The love and dedication Barry had for his wife is an indication of the indomitable strength in his character. Here is a man who never gives up and stands by his morals. Learning of just how much his wife’s illness and passing ‘knocked him around’ over the past nine years has made me appreciate even more his happy-go-lucky demeanour and warm smile which I’ve known him for. Even now in what he calls a lonely period in his life, he is keeping busy on his family’s property tending to his birds and maintaining the impressive aviary he built with his son. Barry has always had an interest in birds ever since he was eight years old and his father brought him back some budgerigars from Sydney. 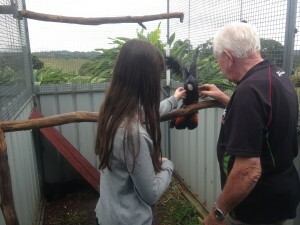 When he was living on his childhood farm in Condong, he had every Australian parrot. Now that’s a collection I would love to see. Not that it makes his current collection any less impressive which Barry took me on a tour of while I followed behind, mouth agape. 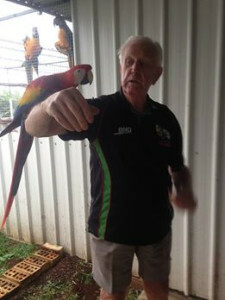 On top of a number of exceptionally colourful, gorgeous parrots, Barry has a pair of Scarlet Macaws, a pair of Blue and Gold Macaws, and my personal favourite, a pair of Black Cockatoos. Barry handles them like his cheeky children, feeding them peanuts and giving little tickles. 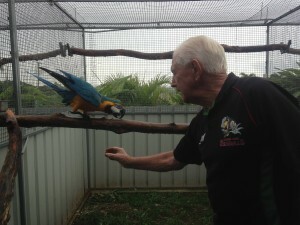 His favourites are the Blue and Gold Macaws because they have a great personality he says. He hasn’t given any of his birds a name which bewilders me when I see how much he cares for them. At this time in his life I believe these birds and his family give him the strength he needs to carry on living a fulfilling life. From what I know of Barry, he is happy when he’s got some work to do and with so many birds and fruit trees to look after I can see him being quite content here.